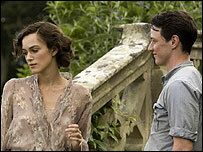 Romantic drama Atonement is leading the field at this year's Bafta film awards, after receiving 14 nominations. Its stars Keira Knightley and James McAvoy are both nominated for best actress and actor and Joe Wright was named in the best director category. 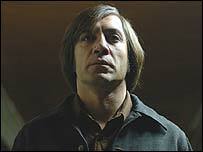 Thriller No Country for Old Men and Texan drama There Will Be Blood each received nine nominations. The winners will be announced at a ceremony at the Royal Opera House in Covent Garden, London, on 10 February. Several movies picked up more than five nominations each, with Edith Piaf biopic La Vie en Rose scoring seven, thriller The Bourne Ultimatum with six, and American Gangster, The Lives of Others and Michael Clayton all receiving five nominations. Atonement, based on Ian McEwan's novel set in World War II, is up for best film along with Sir Ridley Scott's crime drama American Gangster, German Cold War movie The Lives of Others, No Country for Old Men and There Will Be Blood. 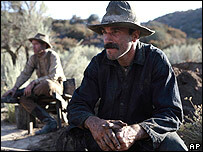 It is also nominated for best British film and adapted screenplay. The movie won best film at the Golden Globes earlier this week. Keira Knightley is up against Julie Christie, who won a Golden Globe for her role in Away From Her, in the best actress category. The pair are joined by Cate Blanchett for Elizabeth: The Golden Age, Marion Cotillard for La Vie en Rose and Ellen Page for Juno. James McAvoy is nominated for best actor alongside Daniel Day Lewis, who also won a Golden Globe for There Will Be Blood, George Clooney for Michael Clayton, Viggo Mortensen for Eastern Promises and the late Ulrich Muehe for The Lives of Others. There was also a best supporting actress nomination for 13-year-old Saoirse Ronan for her role as Knightley's younger sister in the romantic drama. Atonement producer Tim Bevan praised director Joe Wright for making a truly British film. "Most importantly, we have this amazing young director who cast it and crewed it from British people and he got them all to raise their bar and it's fantastic to get this level of recognition," he told BBC News. Director Shane Meadows, whose film This Is England received two nominations, said it seemed "very fitting for a film which is so fundamentally British in origin". He told the BBC News website: "When it did well at the UK box office, I was really chuffed and to receive two British Independent Film Awards and now to be nominated for two Baftas is the icing on the cake." Film critic Mark Kermode also said there were "no real surprises" except for a "slightly poor showing for Sweeney Todd". "It's only there for make-up, hair and costume design and not for any major awards. It's doing very well in America but largely overlooked here." Bafta deputy chairman David Parfitt, meanwhile, said he was "sad for Harry Potter" after the Order of the Phoenix also missed out on nominations in the main categories. The British Academy of Film and Television Arts is now in its 61st year, after handing out its first prize for achievement in film in 1947. Last year, drama The Last King of Scotland and fantasy Pan's Labyrinth both took home the most Bafta awards, with three each.